Fabric, oilcloth, beads, buttons, sequins, gel medium and glitter. Jane Cochran explains" "No one wants to hear about your surgeries, but I had several in 2010 and am lucky to be alive and fine. I had lots of hallucinations on morphine, and they were very interesting. I couldn't remember the word hallucinations when I wanted to, so associated it with the word hallelujah, which is a wonderful word and I could remember it. 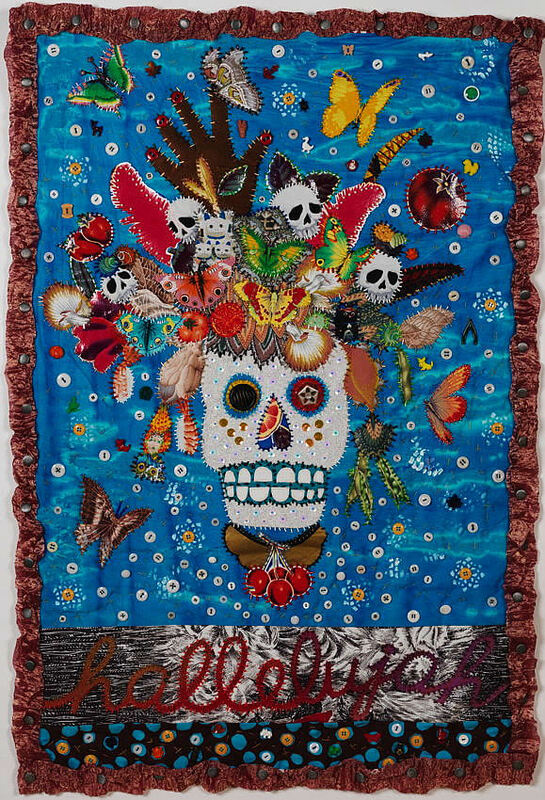 When I could work again, I just wanted to start sewing, so did a sugar skull head and then put together a collage of fabric I had fussy cut as a headdress. I then added the word hallelujah."